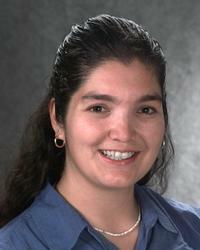 Ms. Anita Abrego’s research encompassed both flight and wind tunnel testing of rotorcraft. Research topics included vibration testing of the XV-15 tiltrotor research aircraft, the aerodynamic performance of ducted fans, descending flight of tiltrotor aircraft and aeroelastic stability testing of rotor blades. Her work in tiltrotor descent aerodynamics testing in the wind tunnel was in direct support of the V-22 Osprey aircraft development program. In 2003, Abrego assisted the Space Shuttle Columbia Accident Investigation Board, and in 2005, she was deployed on a 30-day field assignment to assist the US Federal Emergency Management Agency (FEMA) with the Hurricane Katrina response and relief efforts. Abrego’s most recent research was on the analysis of rotor blade displacement measurements that she and her team acquired during the 2010 full-scale UH-60A Airloads Rotor wind tunnel test that was conducted in the National Full-Scale Aerodynamic Complex 40- by 80-Foot Wind Tunnel. Abrego was an active member of two advisory committees at Ames, the Native American Advisory Committee (NAAC) and the Hispanic Advisory Committee for Employees (HACE). She was a professional member of the American Indian Science and Engineering Society (AISES). Her educational outreach work with the Native American community and with minority high schools — including Eastside College Preparatory School in East Palo Alto through the local AHS chapter — resulted in her being awarded the NASA Equal Employment Opportunity Medal in 2013. Abrego was also the recipient of numerous NASA Group Achievement Awards and a member of several teams honored by AHS International Grover Bell and Howard Hughes Awards. She previously served on the AHS Test and Evaluation Technical Committee (co-authoring numerous AHS technical papers) and in various leadership positions with the AHS San Francisco Bay Area Chapter. Ms. Anita Abrego, a member of the NASA Ames community for over 25 years, passed away on December 27, 2016, at the age of 46. To honor her memory, two classmates have started a memorial student endowment fund at the University of Washington. It will target women pursuing engineering degrees, and it will be weighted toward awarding women of Native American and/or Latina descent. Donations may be made to the Anita Abrego Endowed Student Support Fund at www.washington.edu/giving/make-a-gift.